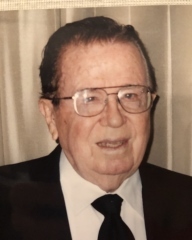 Horace Dewitt Brown died peacefully at Baptist Hospital in Kendall, Florida on Friday, October 12, 2018 at the age of 98. Horace Brown is survived by his wife Helga, and children David Brown of North Royalton, OH, Larry Brown of Chesapeake Beach, MD, and Judy Rivard of Deerfield Beach, FL, stepchildren Karen Cannon of Miami, FL and Eric Tillman of of Gainesville, FL, and 19 grandchildren, 13 great-grandchildren, and 5 great-great-grandchildren. He was preceded in death by his three brothers Royce, Bill, and Henry and three sisters Onabelle, Clarice, and Jo. Horace Brown was an accomplished craftsman with many talents. He loved photography, produced audio-visual programs, and wrote stories for his family. He was a witty individual who loved his family and was passionate about their accomplishments. He was an active and dedicated member of the German American Social Club of Miami. A funeral is scheduled for 2:00PM, Saturday October 20 at Miami Memorial Park. Monsignor Kenneth Schwanger will officiate the ceremony. All are welcome to attend and celebrate Horace Brown’s life. Condolences can be sent to the Stanfill Funeral Home, www.StanfillFH.com. The family would like to thank the caregivers at Baptist Hospital, Five Main, for the compassionate care given to Horace and for their dedication to their patients.